In June 1940 its entire population was removed and sent to either the other Channel islands or to Britain (most ended up in Glasgow). Then the German occupation forces arrived on the 2nd July. Hitler thinking that the British would attempt at recapturing, ordered it to become a Festung and later combined into the Atlantikwall. Alderney, M.B. Elsaß, Fort Albert. 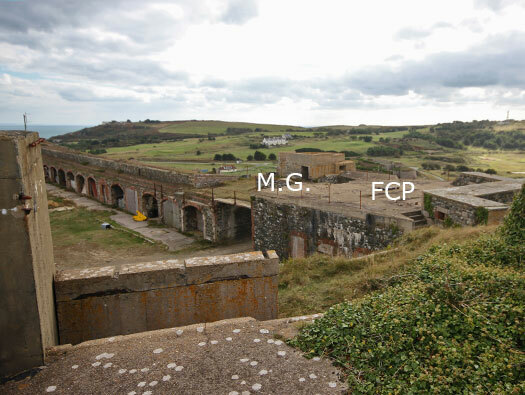 The fort was the HQ of the M.A.A.605. 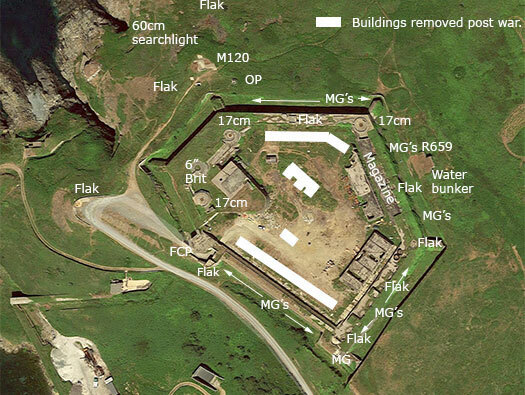 1 x large fort, Fort Albert. 1 x FCP and rangefinder (superseded by M120). 1 x R659 water supply bunker. 3 x open emplacements for 17cm guns built on British 6inch gun bases. 3 x 17cm SK L/40 guns. 6 x 2cm Flak 30. More in the area. 1 x 60 cm searchlight. Many loopholes for machine guns. Fort Albert took four years to build and finished in 1859. Mounted 35 guns and by 1890's two six inch BL guns replaced them. WW1 and a few more modifications with small concrete pill boxes. The Germans placed three 17cm SK guns on the old British positions and also and a batterie of 2cm Flak. Many infantry loopholes and M.G. positions. A rangefinder and FCP was built over the main gate and later a larger purpose built M120 FCP superseded it. Fort Albert and the harbour. 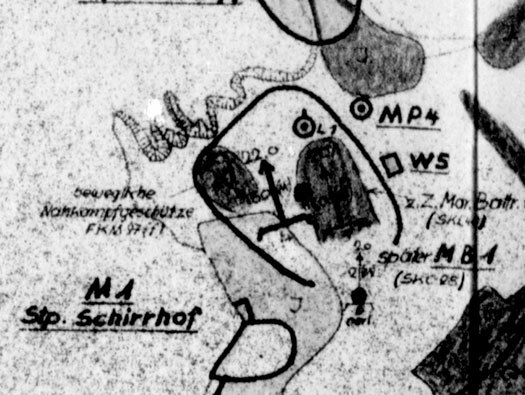 Plan of the fort with its many machine gun positions, Flak and the three 17cm SKC L/40 main guns. Not visited are the M120 FCP, the R659 water bunker and searchlight position. Alderney, M.B. Elsaß main gate. Climbing up from sea level shows how high up Fort Albert is. This is the main gate with several German additions to Victoriana. Musketry parapet covering the entrance. Alderney, M.B. Elsaß machine gun bunker..
Machine gun embrasure covering the entrance. Alderney, M.B. Elsaß sentry box. This may be an air raid shelter for the sentry?? Alderney, M.B. 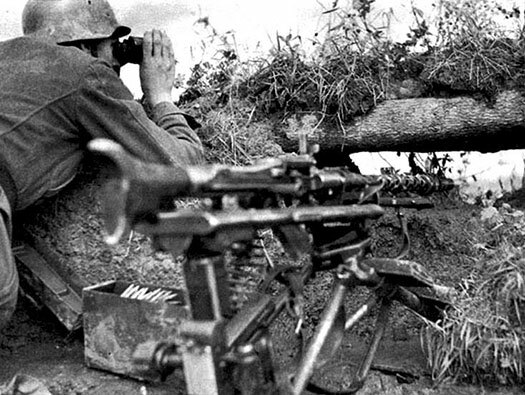 Elsaß Range finder and OP on the roof. Strengthened area for a rangefinder. This was replaced by a purpose-built M120 fire control post. Strengthening to the face of the gate seems not to have worked for Alderney council drivers. Alderney, M.B. Elsaß beach obstacles Tetrahedra II. Removed off the beach and placed up here as storage. Alderney, M.B. Elsaß parade ground. There were many buildings around the parade ground and they were blown up by British soldiers post war. Alderney, M.B. Elsaß Inside the south corner. Musketry parapet machine gun position. Alderney, M.B. Elsaß Tulpe (Tulip). I am presuming that each position around the fort had a code name and as this is Tulip all the others may be flower names?? Alderney, M.B. Elsaß Tulpe in the corner. Alderney, M.B. Elsaß Tulpe ammunition niche. Alderney, M.B. Elsaß Mens barracks. 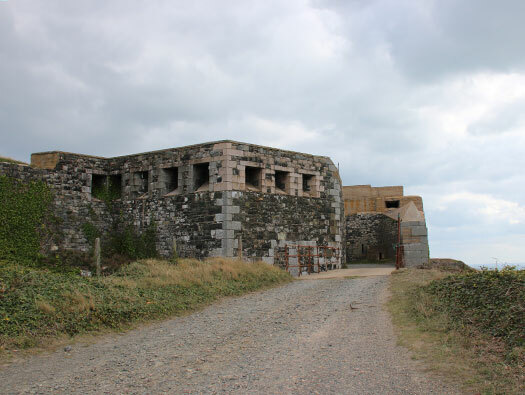 Mens barracks and musketry parapet on the right..
Alderney, M.B. Elsaß Mens barracks and officers rooms on the left. Mens barracks with oblong windows and the officers with large Georgian windows. Stair balustrade to officers quarters. Alderney, M.B. Elsaß 17cm SKC L/140. The first 17cm SKC L/140 gun emplacement . Alderney, M.B. Elsaß ramparts 17cm SKC L/40. All along this wall was a strengthened ammunition storage. Alderney, M.B. Elsaß 17cm SKC L/40. On the left ready ammunition store and on the right a blast wall. Blast wall around the ready ammunition. 17cm SKC L/40 mounted on the top allowing 360° rotation..
Base of the 17cm SKC L/40. The best I could do with a large view from the gun base. More ready ammunition stores that would have had steel doors on them. Alderney, M.B. Elsaß WW1 guard and gun post. WW1 and there was a very real threat from German U-Boats, a lot of British and then US convoys passed by and the islands were manned. 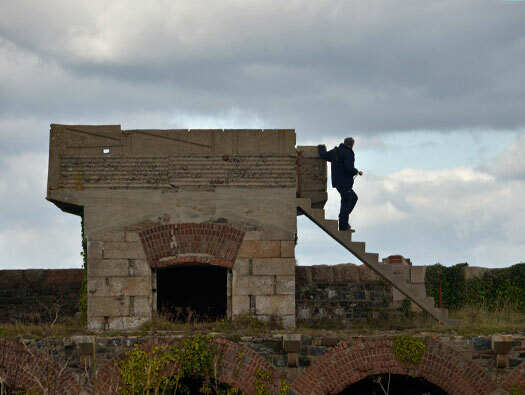 Around the parapet there were several guard posts made of concrete. 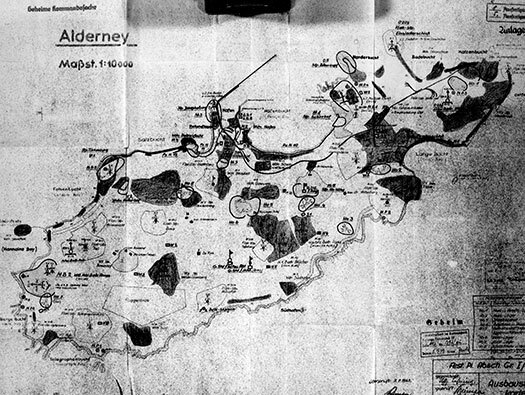 Alderney, M.B. Elsaß guard and gun post. Built over the top of an old gun pivot. 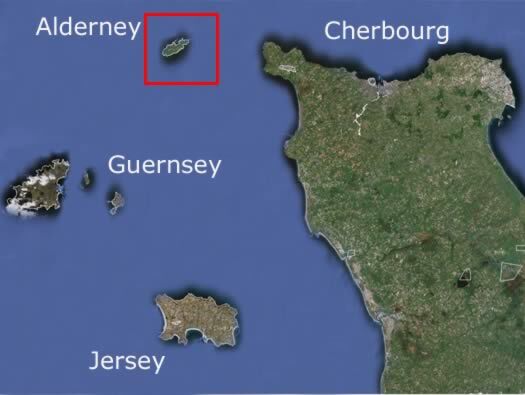 Alderney, M.B. 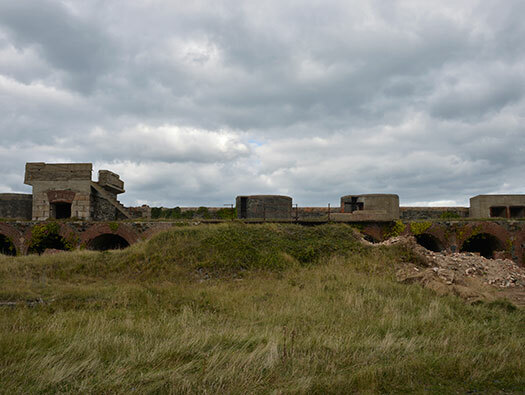 Elsaß 2cm Flak 30 tower & two WW1 pillboxes..
Alderney, M.B. Elsaß 2cm Flak 30 flak tower. Proof that I climbed up there. Thank you John. Alderney, M.B. Elsaß 2cm Flak 30. Where the gun was bolted down. Interesting I have never seen a castellated nut used on a German gun position. Water trough which I think was used to cool down gun barrels in?? 2cm Flak 30 guns and barrels. A very small ready ammunition space. WW1 pillbox, original gun position and steel racer still in place and the next 17cm SKC L/40. Alderney, M.B. Elsaß 17cm SLK L/40. The steps up to the 6inch gun base turned into the second 17cm SLK L/40. Base for the 17cm SLK L/40. Base of the 17cm SLK L/40 with the outer bolts holding the plate down and the threads to bolt the gun down. The hook is to attach a camouflage net. Ready ammunition lockers for the Base of the 17cm SLK L/40. Alderney, M.B. Elsaß 6in Breach Loading gun. When the original guns became obsolete a new type was needed and the 6in Breach Loading VII naval gun.. 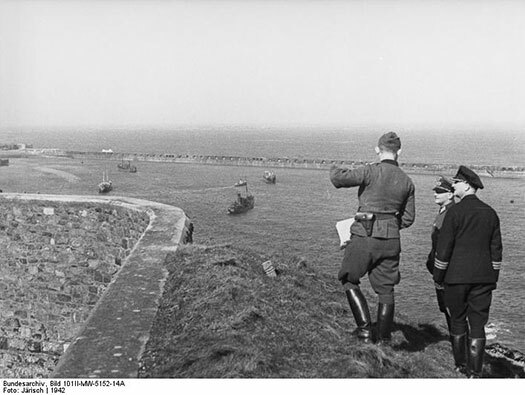 Looking over the lip of the emplacement. BL 6inch rifle at St. David's Battery, Bermuda. BL 6inch cartridge 23lb delivery cover lid. BL 6inch cartridge 23lb delivery shaft coming up from the magazine. There would have been a higher front Glacés may have been built up higher. 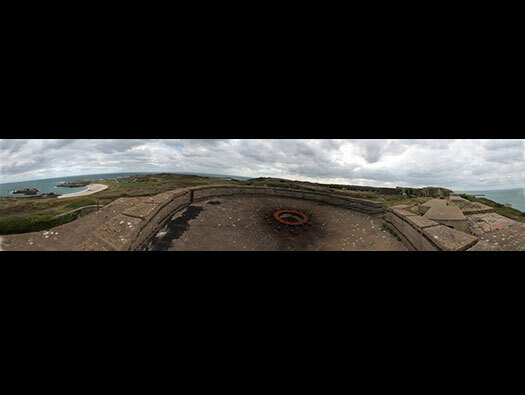 BL 6inch rifle at Newhaven Fort, Sussex. This is where the shell came up from the magazine below. Shell derrik cranes like this one fitted into the two brackets on the wall on the main picture. 17cm SKC L/40 ready ammunition stores. This emplacement is built over the second British 6inch gun position. The two heavily camouflaged gun emplacements. This gun in its place. The original lid for the powder bag to come up from the magazine below. Alderney, M.B. Elsaß Queen Victoria. 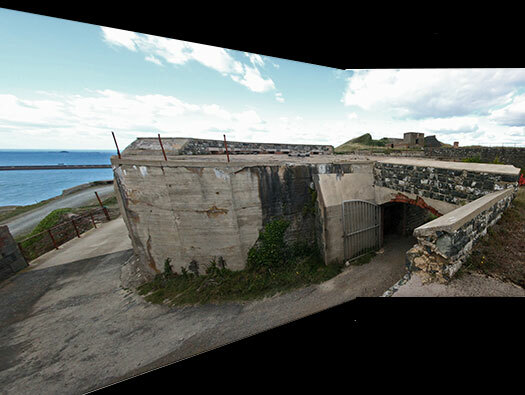 The view down to the entrance with the FCP on the right and Machine gun bunker on the left. The original 17cm batteries fore control position which had a large range finder on the top until superseded by the M120. M.G. pillbox plus a 2cm Flak on the roof. Alderney, M.B. Elsaß M.G. pillbox. The passageway into the pillbox with ammunition niches on the left. Pintail to attach a machine gun broken and on the floor. Alderney, M.B. Else M.G. pillbox. Covering down to the beach. Alderney, M.B. Elsaß Victorian rolling bridge. There were three rolling bridges, these are not like draw bridges but ones that roll backwards and forwards. Alderney, M.B. Elsaß open emplacement. I believe this may have been an early emplacement but by 1945 it was empty of any guns. Looking up to the entrance, the rolling bridge, musketry parapet and the machine gun pillbox. Machine gun strengthened embrasures along the main wall.